This is an interesting project to consider from a Social Role Valorization and PASSING perspective. Who (factually and existentially) are the groups of vulnerable people that this project is focused upon? What are the processes of social devaluation and wounding described in the TEx Talk video? What needs are identified and discussed? Washington Post article: He was homeless when they took him in. An interesting Washington Post article (3 February 2017) to read and analyze from an Social Role Valorization perspective, including for points of heightened vulnerability, the process of social devaluation, interpersonal identification, etc. ‘My guardian angel’: He was homeless when they took him in. He became like family to them. The 26 October 2016 Wall Street Journal article ‘Babies show a clear bias–to learn new things’ describes contemporary research that reinforces the emphasis in Social Role Valorization (SRV) on imitation, role modeling, competency enhancement and the developmental model. “Babies leap at the chance to learn something new.” This echoes the opening line of Aristotle’s Metaphysics: “all human beings by nature desire to know.” If we want people–no matter how impaired or societally devalued–to learn and become more competent, then it is important to believe that they can learn and hold high expectations for their ability to learn, among other things. Another point from the article relevant to SRV has to do with interpersonal identification and imitation. The author notes that babies “can figure out who is likely to teach them.” Babies are already figuring out their environment enough to know who they can learn from, and accordingly pay greater attention to those people. This ability does not stop with babies of course. SRV proposes that we can facilitate interpersonal identification with the goal of fostering imitation, competency enhancement and learning (Wolfensberger, SRV monograph, 3rd rev. ed., pp. 118-121). The 18-19 June 2016 Wall Street Journal article ‘A small fix in mind-set to keep students in school’ is relevant to the Social Role Valorization theme of mind-sets and expectancies. It describes two different studies on the power of mind-sets in schools. Note the connection made between changing mind-sets and changing lives, or in SRV language, how can changing mind-sets create greater access to the ‘good things of life’ for societally devalued people? How might these studies be relevant in other human service fields? Could such studies be replicated with human service workers? “I am pleased to announce that we have confirmed a location for the 7th International SRV Conference, to be held in Winnipeg, Manitoba, Canada from June 4-8, 2018 at the Fairmont Hotel. Monday June 4 and Tuesday June 5 will be pre-conference days and the conference itself will take place Wednesday June 6 – Friday June 8. A program committee is being formed and we will take the opportunity to consult widely at certain points in the process. I hope to be able to announce the theme of the conference, as well as dates for paper and presentation proposal submissions and registration in August 2016. The Fairmont Hotel is located at the heart of Winnipeg’s downtown in the Exchange District, steps away from the intersection of Portage and Main. Conference attendees staying at the Fairmont will be within walking distance of the confluence of the Red and Assiniboine Rivers, popularly known as the Forks. The Forks is a National Historic Site, and the location for the Canadian Museum of Human Rights, the Manitoba Theatre for Young People, the Children’s Museum, the Winnipeg Railway Museum and a farmer’s market in the summer, along with restaurants and cafes. It is the hub for several walking and bicycle trails that extend west along the Assiniboine River to the Manitoba legislature, across the river into Old St. Boniface, the French quarter of the city, and north along the Red River through the Exchange District. Visitors will be within a 10 minute cab ride to Osborne Village or Corydon, areas known for their restaurants and shops. Coming to Winnipeg, visitors will also have the chance to visit the largest collection of contemporary Inuit sculpture and art in the world at the Winnipeg Art Gallery, Canada’s oldest civic art gallery, or spend time at the Journey to Churchill, located at the Winnipeg Zoo in Assiniboine Park. The Journey to Churchill includes exhibits on northern Manitoba and the Leatherdale International Polar Bear Conservancy Centre (where several bears live!). For people willing to travel about 30 minutes to the south west edge of the city, they can visit Fort Whyte, another conservancy area with walking trails, an interpretive centre and a herd of 30 bison. Of course, people are welcome to come and simply take part in the conference as well! This podcast includes the recitation of a written essay followed by several interviews. I recommend listening to the essay written by Gary Presley, read by a professional actor (that in itself is something to consider from an SRV perspective), but also to the interviews with Gary and his wife Belinda. As an SRV exercise, I think that this would require thinking about the essay and interviews from the perspective of various SRV concepts and themes. In light of the complexity of human relationship, and the empirical nature of SRV, any analysis would also raise issues outside of SRV. Description of the presentation: History is known to be one of the best teachers, and yet there is very little teaching of the history of human services. This presentation addresses that gap. Several hundred slides document the evolution of major human service concepts and practices from ancient, informal, voluntary, unpaid personal helping forms to the largely commercialized patterns that we see today. The presentation compellingly shows that human services are full of practices that are now carried on unconsciously, but are actually vestiges or distortions of practices that were originally instituted with high consciousness and very good and strong rationales. The first part of the presentation takes all of the first day. It sketches important antecedents of current human service patterns, from pre-history and the pre-Christian era, and shows that the history of human services of all types is inextricably intertwined with the history of care for the poor, and of residential services. This part shows how the nurses’ station evolved, and how specialized institutions–such as tuberculosis sanitoria, prisons, and “mental hospitals”–grew out of the multi‑purpose institutions and workhouses for all kinds of afflicted and poor people of the 1600‑1700s, which in turn grew out of small, early Christian hospices. This first part traces the evolution of human services into the late Medieval period, and shows the impact of the collapse of medieval services preceding and during the Protestant Reformation. The negative effects on services of political and economic changes during the period of absolutism in the 16‑17th centuries is also explained. The first part concludes by showing how certain service designs and practices are now the opposite of how they started out. The second part of the presentation takes all of the second day. It elaborates on one particular theme that was raised in the first part, namely the interpretation of service recipients as menaces, and the structuring of services on that assumption. It shows how this “menacizing” eventually displaced the remnants of earlier, more benign perceptions and interpretations of recipients, and how it has come down to services of the present. There is a break for lunch and short breaks in mid‑morning and mid‑afternoon of each day. At several points during each day, and at each day’s end, there will be time for questions and discussion. Format of the presentation: The presentation is conducted in lecture style, and is very visual. Both pictures and text projetions are shown, using current and older technologies. As noted above, lectures are interspersed with periods for discussion. Who should attend: The presentation is relevant to everyone involved in any way in any kind of human service to any societally devalued group in any service field, from those on the direct clinical level to those at the highest planning levels, whether they are professionals or non‑professionals, advocates, volunteers, administrators, legislators, theorists, analysts, architects and designers. Anyone who attends the presentation can gain a better understanding of current service challenges, some of the dangers that lurk everywhere, and what sorts of service patterns to strive for. Many people who have attended this presentation in the past have remarked that it fundamentally altered their perception of many human service patterns, and that it helped them to understand, often for the first time, some of the things they had witnessed or were part of, or had contributed to. People who have been through PASS and PASSING training will also find that parts of the presentation speak to the concept of culturally valued analogues, and of “model coherency” of human services. Tuition: $180.00, which includes refreshments and lunch. Agencies that send 5 or more people get a 20% discount. We will not turn people away for lack of funds; if you require tuition assistance, please email register@srvip.org. Registration & payment: Payment can be made via check or credit card. • Or send your name, address, phone number & email address, plus tuition check made out to Shriver Clinical Services (federal id # 04 317 5325), to: Workshop registrar; 74 Elm Street; Worcester, MA 01609. Email register@srvip.org. Upon registration, registrants will receive further information, including about accommodations. 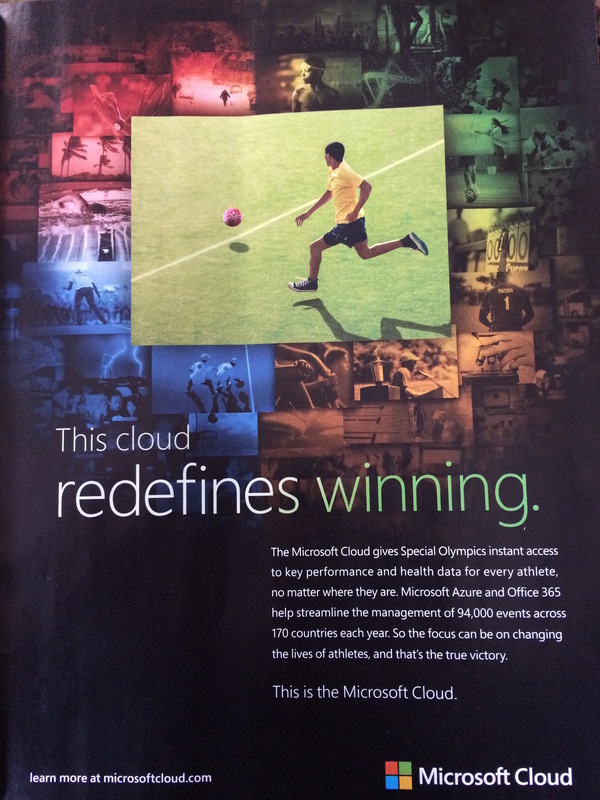 Check out this site and accompanying video from Microsoft Cloud about the Special Olympics. Microsoft has also placed ads on this topic in several magazines. Based on the material in the SRV monograph and workshops on image enhancement, as one of the tools of role valorization, and the material on imagery in the PASSING tool and workshop, what is your SRV based analysis of the video and advertisement? This would be a good exercise for university classes and for SRV study groups. According to the article, “ ‘The main problem has been that they do little during the day, which doesn’t help them at the present, nor for their future outside prisons,’ said Alessio Scandurra, who works for Antigone, a nonprofit group focused on the rights of detainees. • In the PASSING manual, Dr. Wolfensberger and Susan Thomas write that one of the few human service practices that does not have a culturally valued analog (CVA) is a prison (p. 31).